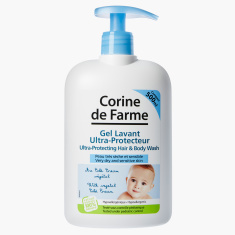 Corine de Farme Ultra Protecting Hair and Body Wash - 500 ml | Multicolour | Gently cleanses your baby's delicate and sensative skin and a fine hair. 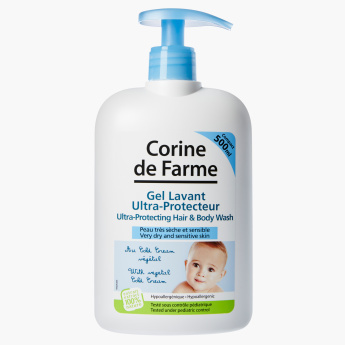 Keep your baby clean and germ-free by getting this ultra protecting hair and body wash enriched with natural ingredients. The pump at the top ensures ease of extraction and avoids wastage. Feature 1 : Gently cleanses your baby's delicate and sensative skin and a fine hair. Feature 2 : Enriched with natural ingreadients leads extra moisturizer.